There was much in the theology of John Calvin that Wesley appreciated and agreed with. He wrote that on justification he and Calvin were but a "hair's breadth" away on the doctrine. Wesley also liked much of Calvin's doctrine of the Holy Spirit (He thought Luther's account of the Spirit was "stunted"). But when it came to the Calvinist understanding of predestination, Wesley pounded the pulpit expressing himself in no uncertain terms. Even though he published an essay entitled, "Predestination Calmly Considered," there was nothing gentle about Wesley's response. In his sermon "Free Grace," Wesley referred to the Calvinist view that God has assigned some to hell as portraying "God as worse than the devil." Like Calvin, Wesley believed that God is the one who takes the initiative to offer salvation. Without grace salvation is impossible. 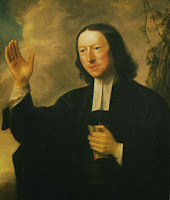 But, unlike Calvin, Wesley believed that the offer is made to all, and all persons, through God's prevenient grace, have the opportunity to respond. Divine grace is necessary for saving faith, but such grace can be resisted by the individual. Father John's problems with Calvin's "double-predestination" can be summarized in a three-fold manner: First, it is a rejection of free will. Thus, our seeming choices are not choices at all; it is simply smoke and mirrors. Third, it undermines the motivation for Christian discipleship and mission. Why go into the world and preach the gospel if it has already been determined who is saved and who is condemned? 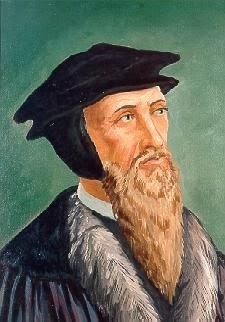 The Calvinist response that we should preach the gospel because Christ commands it, still does not deal with the truth that those chosen for life will accept it, whether we preach or not, and those assigned to perdition will reject the message, whether we proclaim it or not-- the decrees of God, after all, will not be revoked. Good points. 2 Peter 3:9 is one of my favorite passages in this debate as well. It's as clear as the Scriptures can get. It is for this reason that today I am a United Methodist and not a Presbyterian. However, both my wife and I say we were "Predestined to be Methodist." My Doctoral adviser, a Presbyterian theologian and college professor said with great solemnity, "I don't think Calvin would have ever said that." I don't think he caught the joke.